Texture? Isn’t hardwood flooring flat? Not necessary. Texture can be a very important element to add to a hardwood floor. The sensation when walking on hardwood floors that have texture is fantastic. The dimension of the wood can be observed and felt, which makes walking on it more of an experience. This can be somewhat obvious, or dialled in to be almost imperceptible. When a hardwood floor is finished onsite, this element of texture can be utilized to its greatest potential! What benefits can texture have for a hardwood floor? There are 2 main benefits. First, texture can greatly alter the look or appearance of any hardwood floor. Generally, it can add a great deal of rustic character to any specie of wood. For example, if an oak floor is sanded flat and stained in a deeper brown tone, it can have a formal appearance. Conversely, if the oak floor has texture and is stained in a custom driftwood colour, it can make the floor look more organic, aged, rustic, and lived in. Many types of texture can be added to any hardwood floor to enhance the wood. Saw marks are a great feature to hardwood flooring. It adds dimension and character. The amount of saw marks can vary as well, anywhere from 90% coverage on the top of the floor boards, to 5% coverage. It just depends on the ambience that is trying to be created. Sometimes, the desired look is to see the sawn marks, but not to feel them. That can be achieved by trowel filling the entire hardwood floor. Then the floor is sanded. The sanding reveals the saw marks, yet the sawn marks are barely felt or are undetectable to the touch because the filler has filled in the low spots. Still, other methods such as scraping add texture. Again, a hardwood floor can be heavily scraped to create a very dramatic sensation. Or the scrapes can be more subtle and subdued, creating a more low-key appearance. Wire brushing, and other techniques are also effective in adding texture to hardwood flooring. The second benefit of having texture on a hardwood floor is that the texture makes the flooring more forgiving and easier to live with. Picture a coffee table. Think of the full gloss, jet black finish applied to the flat panels of wood. It looks great. But would it be very forgiving to live with? Would you want that finish on your floor? Would you want your dog walking on it, or your children playing on it? 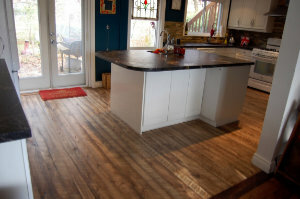 Would you want that finish on your floors in your cottage? Would you want that finish to be in your place of business? For all these questions, the answer is likely to be no. The finish on the coffee table looks great but it would be a nightmare to maintain and keep looking great if it were a hardwood floor. Now think of a coffee table where the sheen is lower, the colour is a warm grey, and the boards are textured. You can feel the texture and see it. With a finish like this, it becomes much more forgiving! When texture is applied to our floors, they become dog proof, child proof, restaurant proof, and suitable just about anywhere. Having texture on a hardwood floor is the single most important element to have to make it forgiving. Even if you have existing floors and want to refinish them, we can sand them, add texture, and give you a floor that will last a very long time and look fantastic.